The story of Babel lives large in our popular consciousness. Like the other pre-historical accounts in Genesis—like those of Adam and Eve, Cain and Abel, and Noah’s Ark—the Tower of Babel is an archetypal story that resonates deeply within us and carries a profound truth about our humanity and our relationship to God. 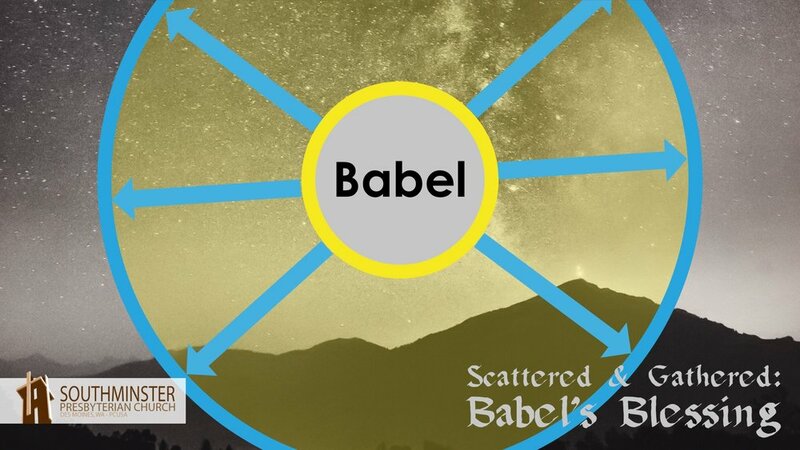 Babel is often considered a story of God punishing a rebellious humanity with the curse of division. Such an interpretation, while not ill-intentioned, has been used to justify the subjugation and oppression of other cultures around the world. It seems appropriate to me that on this World Communion Sunday, we might consider a different interpretation. I believe that with a careful consideration of the passage, we will discover a more profound truth about God’s action at Babel. Mind you, I’m not interested in re-casting the people of Babel as heroes—they are clearly flawed representatives of humanity, but hey, so are we, right? Babel represents the classic monoculture. A monoculture—try imagining a petri dish with a single species of bacteria—is marked by its similarities, not its differences. The people of Babel found security in their unity, and they longed to preserve it. The city and tower are not insidious plans, but rather a means to an end—a means to keep humanity united in their uniformity, that is, to perpetuate the monoculture. 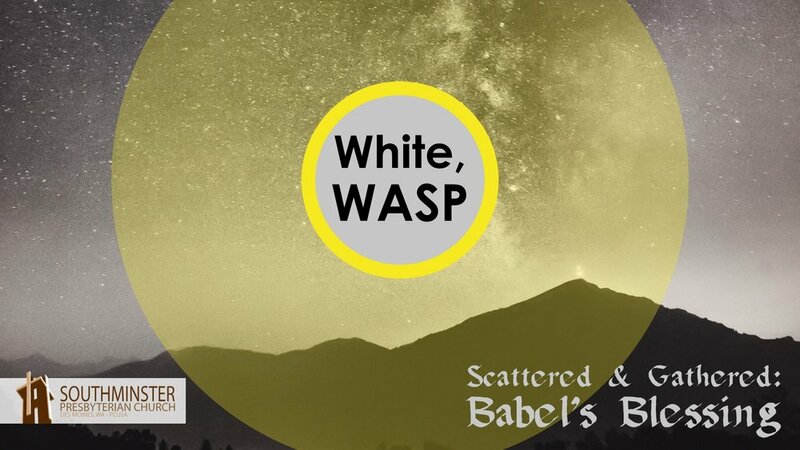 The people of Babel wanted a clearly defined identity, a tight boundary on who they were. They feared becoming diffused, spread out, disconnected. The Bible tells us explicitly that Babel was built to draw people into the center, to protect their identity. As we were discussing songs for this morning, I was describing the tower, and Edie excitedly burst out, “Like in Lord of the Rings!” Which struck me as a pretty solid illustration. Now, the people of Babel certainly did not have the insidious intent that Sauron had, but yes, I think the goal of the dark tower of Barad-Dur and the Tower of Babel were similar. They were meant to hold power, and to gather people together for the sake of protecting that power. There are still organizations in our world today that seek enforce mono-cultural values. These range from the Saurons of our world, like ISIS, Nazis, and the KKK, to seemingly benign institutions like country clubs with annual dues in the six figures. In the history of our own country, white people, or perhaps even more specifically, white, Anglo-Saxon, protestants have enforced their own sort of monocultural identity. From our Declaration of Independence, which, despite declaring all men to be equal, goes on to describe the natives as “merciless Indian savages,” to the “3/5 compromise” that established the partial human value of a slave, our nation has sought to enforce its white, mono-cultural identity. In few places is this more apparent than in the popular notion of America as the “Melting Pot.” The term was originally coined by a Jewish New Yorker named Israel Zangwill as the title of his 1908 play. His play celebrates the peaceful unification of people of all colors and nations joining together to the glory of America. However, time has taught us that color-blindness only works to favor the dominant culture. It creates an assumption that white culture is correct and true and right. When we say, “I don’t see color,” we fail to see the full humanity and appreciate the true diversity of those around us. This failure to see and appreciate is the legacy of the melting pot. But back to the plains of Shinar. God sees the disobedience with which humanity is responding to God’s command to fill the earth, and the consolidation of power within the city and tower of Babel. God says, “Look what they have begun to do,” and decides to mix up their language. Note I did not say “confuse.” This word appears over 40 times in the Old Testament and this is the only place where the NRSV translates it as “confuse.” I don’t think God came to confuse, but rather to mix, or mingle up the languages of the people. As God mingles their languages, God creates diversity from the Babel monoculture. 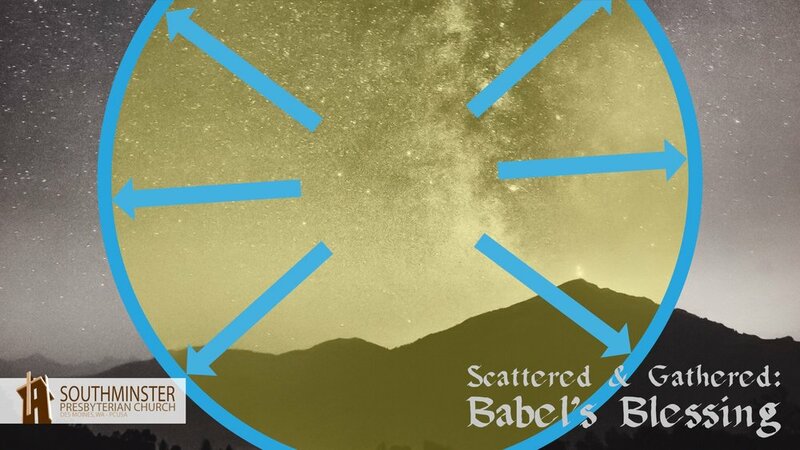 God scatters the people of Babel, pushing them from the center of power to the outskirts. God says in essence, “Out you go!” and the center of power fades. Jesus also followed this same trajectory in his own life, ministering not through the temple-state apparatus of power and control, but to the social and geographic margins. At the outset of John’s gospel, his would-be disciple Nathaniel asked, “Can anything good come from Nazareth?” Jesus came from a backwater and spent his whole ministry in the company of those unappreciated by the state and religious authorities of his day. In my last year of college I left University Pres. and started attending a little church on Capitol Hill called Westminster. It was dying, but honestly, it was dying well. 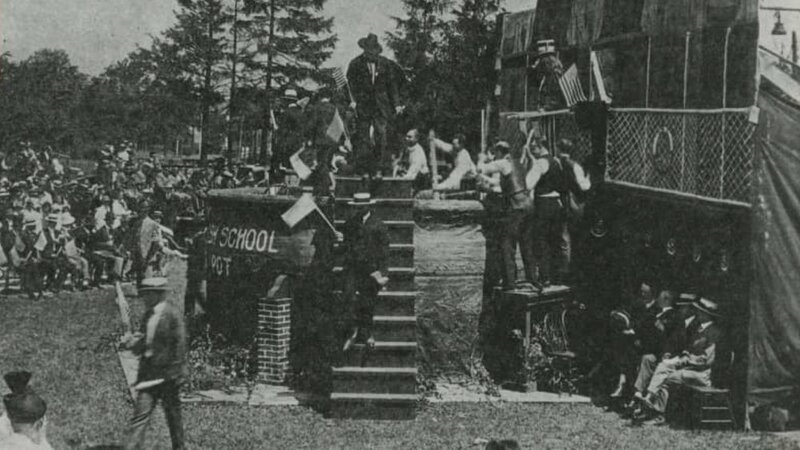 In its final years their Session had decided to spend out their endowment in faithful ministry to their neighborhood. On any given Sunday maybe 35 of us would gather to sing, pray and hear the word proclaimed. As that church declined, it experienced a blessed scattering. Some left for mission work in other countries, some for journeys across our country, and a few remained to become what is now Capitol Hill Presbyterian. I left to come here to Southminster. The church faithfully sent us off to share God’s good news. But scattering is not all God does. At Pentecost we see the fulfillment of Babel’s blessing. You see, the story of Pentecost provides the key to understanding God’s motivation on those plains. What exactly happened at Pentecost? Did God reverse the mixing of Babel’s language so each person heard the same thing? No! When the Spirit came in power on that day not only were the disciples speaking in other languages, but each person hearing them heard them speak their own native tongue. 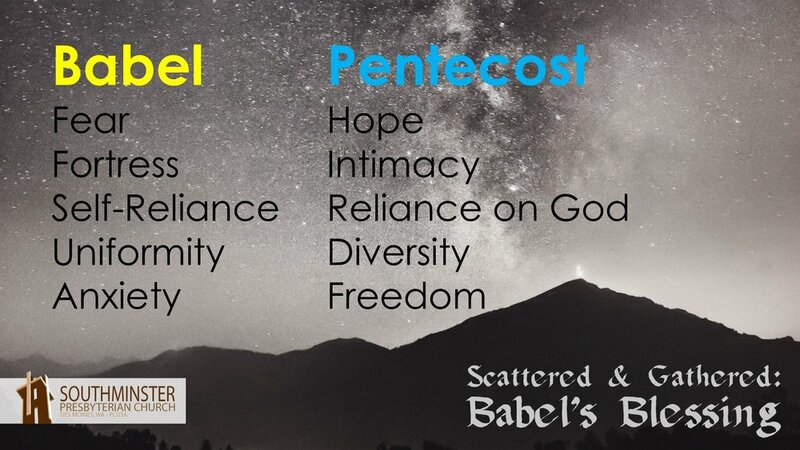 If God’s mixing up of language at Babel was a punishment, then at Pentecost, wouldn’t God have reverted to one language? Pentecost was about gathering humanity back together in diversity to hear the good news of God’s reconciliation in Jesus Christ. I don’t think it is an accident that in the Lord of the Rings a fellowship made up of all different races—elf, dwarf, hobbit, wizard and human—band together to defeat the centralizing power of Sauron. Cultural diversity is part of God’s design, God’s desire--one more aspect of creation that God spoke into being. It is not the result of God’s punishment. People desire uniformity, God desires diversity. Through the blessing of Babel and the promise of Pentecost, we are called into a security that transcends the walls we build. We are not united by unpredictable human leadership, but united under the loving lordship of Jesus Christ. God’s full purpose for the world is revealed in the diversity of all creation, human cultures included. Friends, we are but one small part of the whole, but through Jesus Christ, with our sisters and brothers around the world, we can celebrate it all.